The plan, wood and power system have arrived, and I will be cracking on with it very shortly, starting with the fuselage because that's where I always start, and I am a middle aged man and therefore fear change, And because an on line retailer provided me with trailing edge stock that curves like a boomerang, so I will have to replace it. I am using a PROPDRIVE v2 3542 1000KV rated at 47 amps with a 60 amp speed controller and 4s 2200mah batteries. I haven't decided on the propeller yet but am thinking something like 12x5. As per Nigel R's recommendation the FWall will be placed about an inch further forward, and I think I will work out a bottom mounted hatch for the battery. 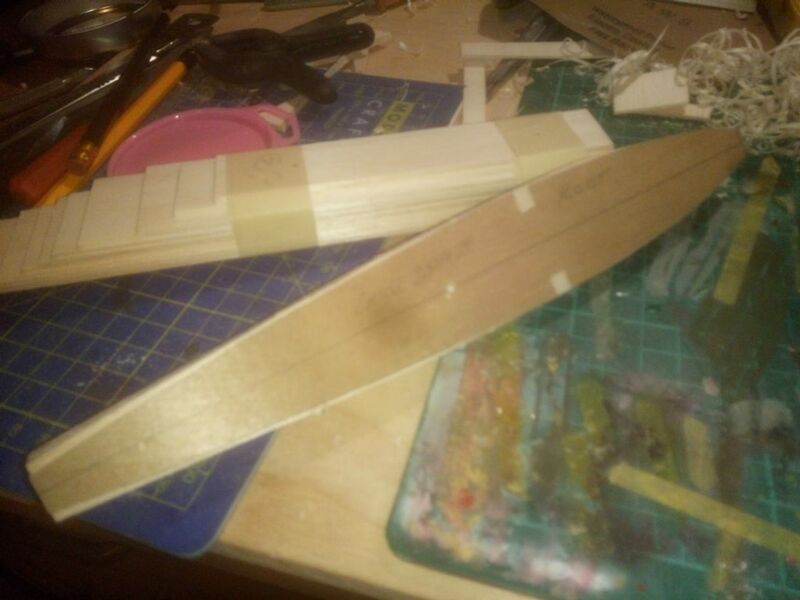 Aileron servos will be fitted in each wing for simplicity and because I like nice short linkages. 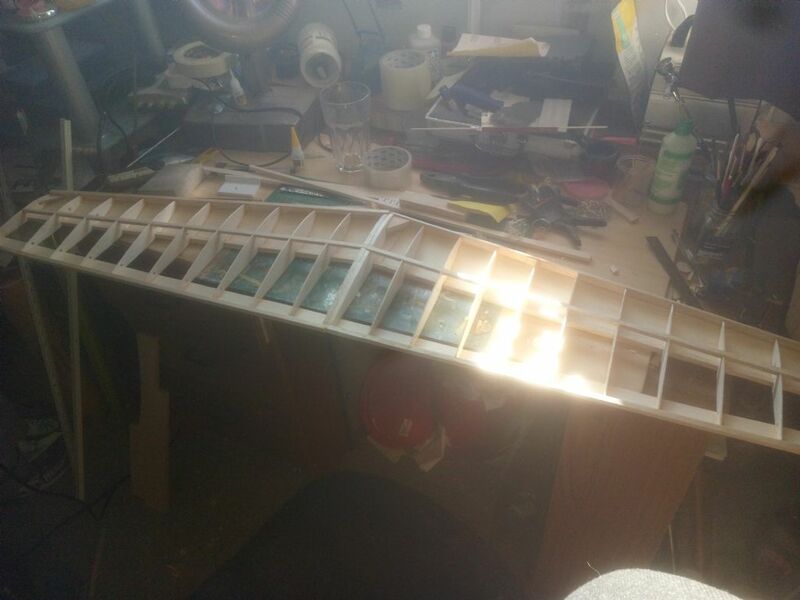 That seems about it, so time to clear the board and assemble the SLEC fuselage jig before another banana takes shape in the workshop. Any suggestions, caveats or hoots of derisive laughter welcome. You'll struggle to get it to nose over. It sits low. It is long. The wheels are quite forward. And are also set wide. Ground handling is excellent. 12x5 is (in my opinion) way too much diameter for 4S, and not enough pitch and I think you will find it draws a monster current from that 1000kv motor - I'd suggest 10x6 or 10x7 and go from there. As a comparison, I just finished an RM Aerobat, which is somewhat sleek although not quite as much so as the Chilli, it is just shy of 3-1/2lb, has a 10x6 on a 3536-910kv motor with 4S 2200mAh lipo, my wattmeter shows 450W and I get an 8 minute flight. Might be worth planning ahead for motor mounting & cowl arrangement. My larger Chilli, uses a 2-1/2" spinner. This means the nose ring can be (and indeed has been) opened up enough to get the motor in through the front. Four small notches provide just enough space to get the screwdriver at the mounting screws. Not sure if that approach would still work on the smaller size - what is the spinner, 2"? Going to be tight! An 11 x 5 drops it to 608 watts and 47 amps. ^ I have a 3536 - 1050kv which showed 550W on a 9x6 ! ecalc always seems to come out a little conservative when I try it. At least, compared to the "just charged" numbers. 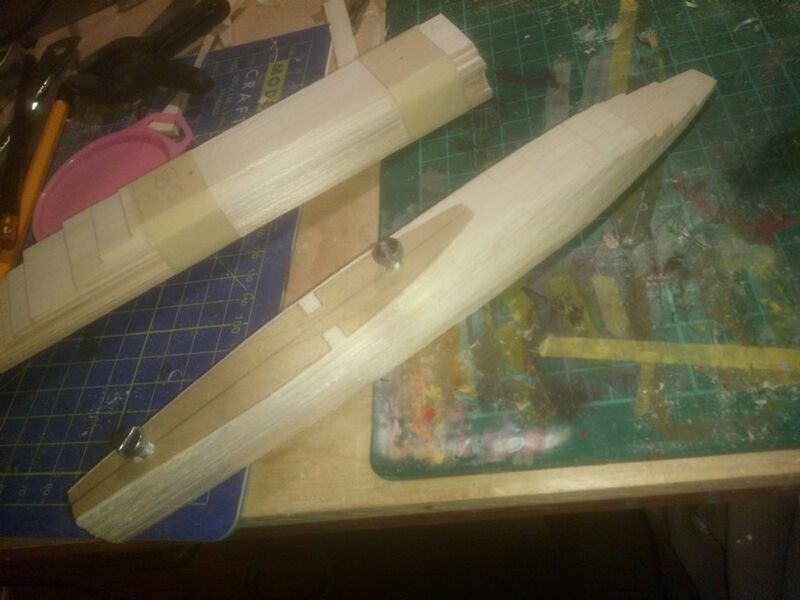 A slightly delayed start due to life the universe and everything, but tonight I got the SLEC jig together ( one of those jobs I had been meaning to get around to ) cut the root and tip templates and sandwiched some balsa together. I've not used the sandwich method before so decided to start with that - having a set of wing ribs always cheers me up. I've been playing with a plan built Cardinal as well ( I have always had a terrible habit of doing more than one project at a time ) and that is up to the installation and covering stage. I've actually started. I cut the ribs ( and decided I REALLY dislike the sandwich method - although alighning them all to the trailing edge may not have been the best ides - perhaps aligning them equally to the leading and trailing edges would be better. Either way it' done now but I am going to do it differently next time, just to be sure. the plan calls for the TE and LE to be supported first, then the ribs, THEN the spars, but being an Olde Farte with some Fixed Ideas, I've decided to put the spars in first aligned to the TE then add the LE. I am not sure which way is better, but so far the wing is nice and true, so I am happy so far. Having paid seventeen quid for the plan ( I think this is the first time I have built from a plan that wasn't free in a magazine, or from Outerzone, and only the third or fourth plan only build I have ever done) it felt odd chopping it up, but there we go, I suppose. Rather than covering it with cling film, I use double wide sticky tape and that keeps everything glue free and doesn't crumple or get in the way as much. It's not the best build by a long way, but it's a start - and I am enjoying it. I can't stand the sandwich method either. All the edges come out at an angle and need dressing afterward, and I always ended up with lumps and flats shouldn't be there. I like printed templates much better. They seem to take about the same amount of time to make a rib set. And it is more accurate when done. Hi Nigel and Piers: Indeed - I think I'll be investing in some kind of rib/drawing software in future. After some fettling I am here now - about two thirds of the way through the wing panels. In a spectacular case of having the instructions printed out next to me and ignoring them completely I put the root ribs on because of course I did. 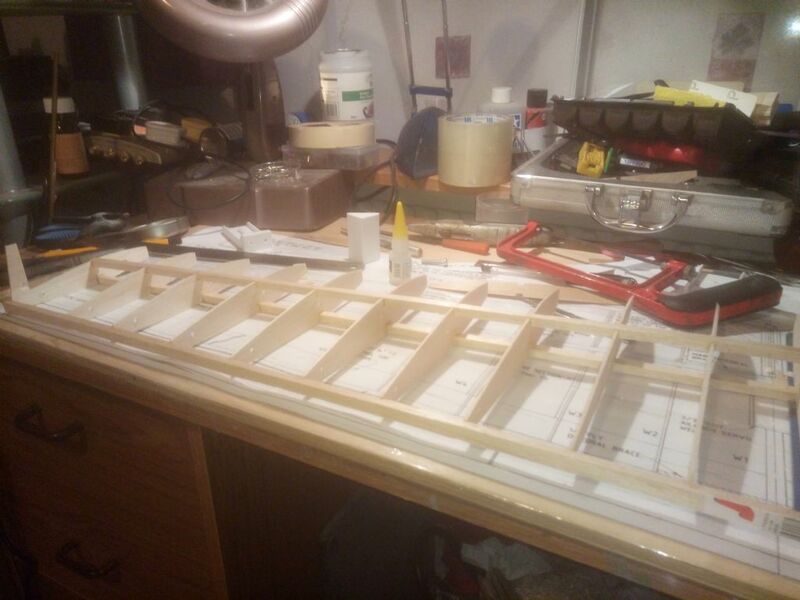 I really should have thought about it more but I decided at the time that I would just cut the ribs away where the dihedral braces would go, so that's what I am going to do. It'll be fine, I just shouldn't have been watching TV and building at the same time. My building will never be to the standards that some of the folks on here exhibit but it normally is good enough to get a well behaving aeroplane out of things. Having gone back to look at the instructions again, I see that they mention spar webs - although none are shown on the plan - does anyone have any advice here? I am kind of leaning toward putting them in out of a belt and braces attitude. Servo mounts will go on very soon - possibly this evening and I hope to start the fuselage tomorrow, using a jig for the first time. And I need to start thinking about the battery hatch. Stuart Marsden's electric conversion thread is being very helpful, btw. 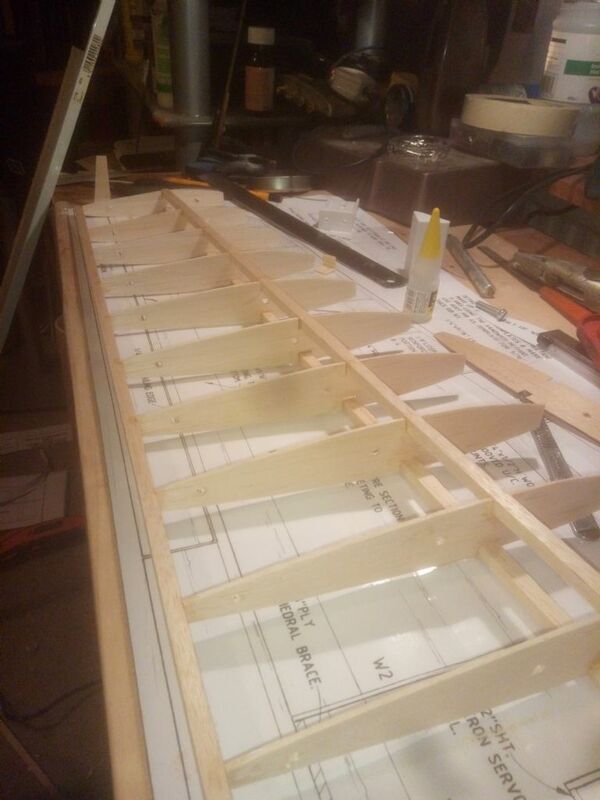 Undercart will be mounted on the fuselage rather than the wings so I will beef up the mounting area too. Personally, yes, spar webs. Massive increase in strength for a modest increase in weight. Grain vertical of course. Servos in the tail, even nine gram ones, will require quite a bit of weight in the nose to counter-balance. Just as well that you are moving the motor bulkhead forward. Yes, definitely use spar webs. Weight, almost nothing, increased resistance to warp and bending, lots. It's not belt and braces, the webs simply complete the D box structure, without them it is only part formed. I'd personally never use smaller than a HS225 on the tail surfaces on something this size, and HS81 for ailerons. Preferably in metal gear flavours. 9g are ok for park flyers that weigh 1/2lb. HS225 - good choice; cheap, powerful and reliable. HS85MGs in the wings perhaps. I reckon a ply doubler will be even more important if you mount the u/c on the fuselage. Maybe reduce the height of the ply though, perhaps just draw a straight line from F1 to the end behind the wing - a long thin tapered triangle shaped doubler which would almost halve the ply and glue needed. Of course extend it to the new F1 if you move F1 forward. Would be sufficient for electric. A ply doubler usually means a plane stays resonably straight, intact and repairable after a crash or hard landing. Worth fitting. Consider a torque rod u/c as used on many of Peter Millers recent models also Boddington designs etc.etc. Well spotted kc, fuselage mounted U/C definitely favours a ply doubler, and I'd agree with tapering it. I'd draw a straight line from top of the firewall to a point about 1" above the wing TE though, just to give a bit of meat across the wing saddle. You just need a 1/8" ply plate on the fuselage underside. Several bits of 1/8" birch ply or 1/8" spruce go above the plate and hold the torque arms in place. On a low winger I would stick the U/C on the wing though. You can get the wheels further apart and the whole thing is thus a bit more stable. That's what I was thinking, my first trainers had undercarts like that easy to make and very forgiving - our field is lumpier than a lumpy thing so this kind of undercart with 2 1/2 to three inch wheels should do nicely. point taken about wing mounted u/cs though and will be born in mind for the future. If you angle the slots that take the vertical part the wire can be flat and not 'handed'. Angling is done so the wheels come under the LE or whatever suits the design. The flat wire parts are therefore useful for other models too - they outlast the model normally and also make the old model without u/c easier to store. The slots in the ply need to be staggered by the thickness of the wire to allow the u/c legs to fit alongside each other. I always cut the slots in 1/8 birch ply slightly undersize and cover the slot with a slightly smaller piece of ply- total thickness is then 1/4. Then at final stage run an exact size drill through which gives a slop free fit. Easier than trying to drill an angled hole through 1/4 ply! All Forum Topics > Classic Aerobat Build Blogs > Chilli Breeze from Sarik Plan, Electric Conversion.